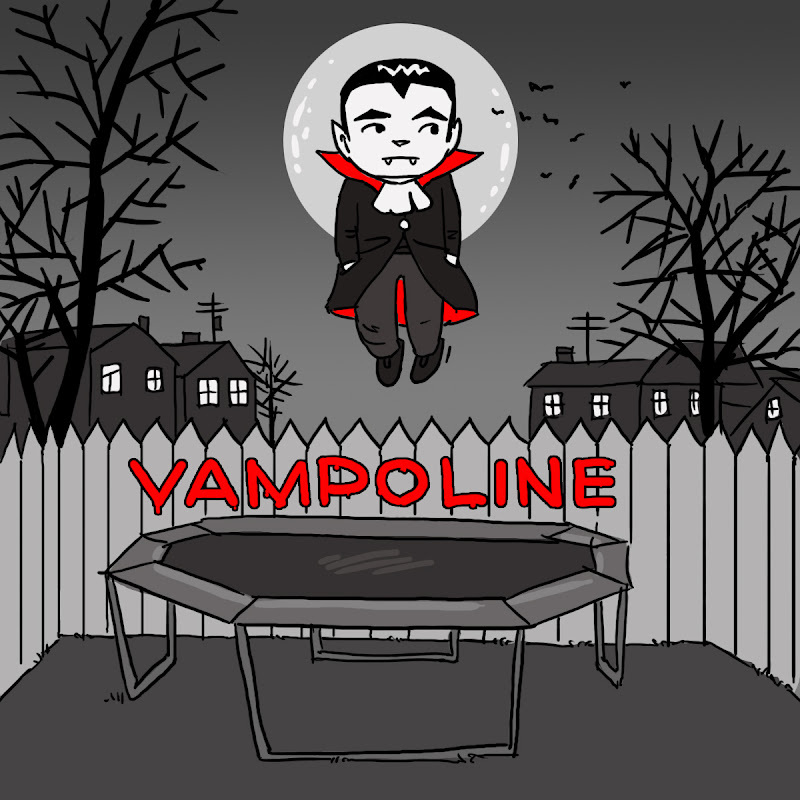 This is the story of a boy vampire and his trampoline. Now, I didn't have a lot of time to think this one through. In fact, to be honest, there's really not much of a story here. But if I understand current publishing trends, if there's a vampire (or zombie) on the cover, you don't really need a story. In fact, the dumber the story is, the more it will sell. Guaranteed! Publishers, I will start the bidding for full rights to "Vampoline" (movie, book, merch, eventual retelling of the book in graphic novel form) at 1.1 billion dollars. The other day, I stood in front of the YA shelves in the library and said (well, whispered furiously while shaking my fist at the ceiling) "I am so over vampires!". Turns out I was wrong. I would buy this. And a vampoline. If the trampoline becomes obsessed with his vampire, and threatens to hurl itself at an on-coming Chinese Olympic gymnastics team, if his batty friend leaves him for bouncier pastures, you have pure gold. I love how the editor vaporized the writers in The Land of Doom. Hilarious! I totally believe that ideas are out there swirling around our heads and if you don't get the idea, someone else will. I also liked the editorial vaporization. I really want to be an editor! Lizzie--This comment made me laugh and laugh. If this book gets picked up, we're using your comment as a blurb. DaNae--Nobody has ever mixed vampires, trampolines AND the Chinese Olympic gymnastics team. This could be the picture book of the decade. The CENTURY! Leea--You've got 1.1 billion dollars? Sweet! Abby--I hate to admit it, but I cornered the visiting editor at my first conference. I forced my whole packet on her (it had original art and everything in it) she was actually very nice about it all. Of course, she dismissed it and I felt stupid. But hey, live and learn. I once heard an editor say that they "felt like the turkey at a thanksgiving dinner." at writers' conferences. Edith--Yeah, I kinda would too. I've noticed that when the visiting editor speaks, half of the audience decides they'd rather be on that end of the publishing table. The Q & A session starts with manuscript submission talk, but ends with "How do I become an editor?"